Building off of Alexandra’s and Julia’s excellent posts about our 10-day immersion into the world of science policy, I thought I would share some thoughts from our climate legislation group exercise. I felt this practical experience – like the others indicated in Alexandra’s post – was adroitly woven into aforementioned conversations with prominent experts. In particular, this legislation exercise provided us with an opportunity to reinforce some of our earlier fundamental policy lessons through a mock Senate committee markup and vote on climate change risk management legislation, cementing the notion of thoughtfulness as being essential in any policy making endeavor. The multi-day exercise began on a Wednesday with a review of H.R. 2380, the Raise Wages, Cut Carbon Act of 2009 (111th Congress), which was introduced on May 13, 2009 (but never enacted). The language can be found here. Essentially, this bill was a revenue-neutral amendment to the Internal Revenue Code of 1986, placing a tax on combustible fossil fuels and using these “carbon tax” revenues to offset social security taxes. The idea was for the cohort to introduce amendments in a Thursday session and hold a final vote during a Friday session. Stated goals for the participants, through the experience of doing, included developing a practical understanding of the potential political views of and landscape for the offices we respectively represented, as well as those of our fellow committee senators, and organically establishing an informed strategy for building consensus. 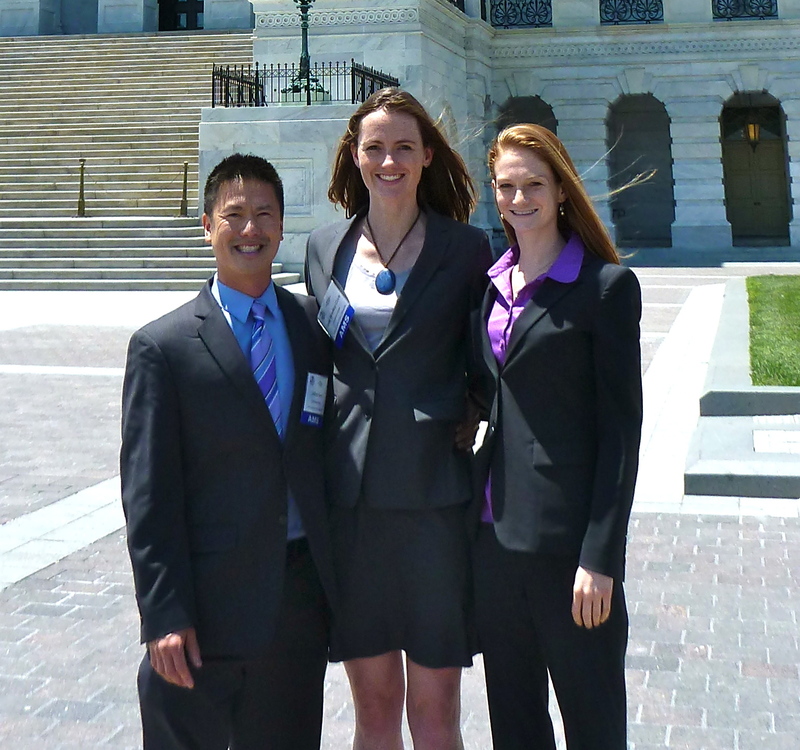 With 36 graduate students, faculty, and professionals in the field of atmospheric sciences divided into nine small groups, each representing one member of the Senate’s Energy and Natural Resources committee (113th Congress), the activity seemed a touch audacious. Then again, how hard could this be? It turns out the process of building consensus is hard. To start, four people had to come together and figure out how best to represent the constituents of their newly adopted state, which turned out to be our first lesson in compromise and diplomacy. Add to the “consensus of four” dynamic a reasonably imagined balance between ideology and constituency, such as “how would a Democrat from coal-friendly West Virginia react to this bill,” and I started to feel the very real weight of possible scenarios overload. The committee markup exercise itself, streamlined for the purposes of the colloquium, allowed each “Senator” to offer one first-degree amendment to the bill and one second-degree amendment (an amendment to an amendment). Possible amendment strategies, also streamlined for the purposes of the exercise, ran the spectrum from actual, substantive improvements to the language and/or outcomes contained in the original bill to suggestions that, for all intents and purposes, makes it impossible for the altered bill to pass. To say our cohort approached this with zeal may be understating the fervor with which we embodied our respective committee members. Every “Senator” offered a first-degree amendment as well as one second-degree amendment – an unofficial first in the 14-year history of the colloquium. Every “Senator” used at least 8 of their 10 allotted total minutes of speaking time to explain and advocate their amendments. Yes, there were amendments that split states along energy production criteria. Yes, there were amendments that split states along demographic criteria. Yes, there were impassioned floor “speeches” and exuberantly titled amendments (e.g., the “Reinvesting in Secure Energy (RISE) for America” amendment – RISE for America(!)). One amendment even had a catchy slogan! The impressive moment of the exercise, in light of all that led up to it, predictably occurred near the end of the exercise. Over the course of three days, we collectively discussed and debated the virtues and failings of all the amendments. 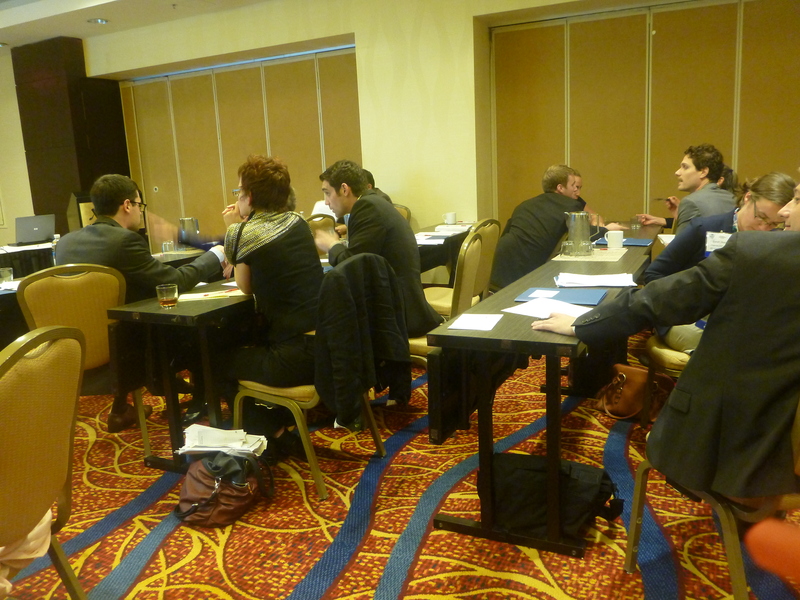 During the last day, a growing comprehension amongst the cohort began to fill the room. As we marched through each “yay” and “nay” vote, arguably complicating an already arguably elegant (i.e., simple and straightforward) bill with our amendments, a simultaneous desire for consensus emerged. The nine chosen “Senators” included four Democrats, four Republicans, and one Independent. Just before the vote on the final proposed amendment, a request for a short recess to confer with our respective party caucuses was called. This move may have even surprised our esteemed moderator, Paul Higgins (Director AMS Policy Program). This presented an opportunity to find common ground amidst our challenging sea of amendments. But how? A strategy emerged out of the hurried recess that somehow resulted in an amended bill we all were able to vote on (and pass). Realistic? Perhaps not, but the process we experienced contained rich lessons in diplomacy, compromise, and the importance of relationships. We never would have come close to our (perhaps) fanciful bill without conversations with each other. Overall, this simplified exercise illuminated the complexity and nuance of legislation creation (and ratification). 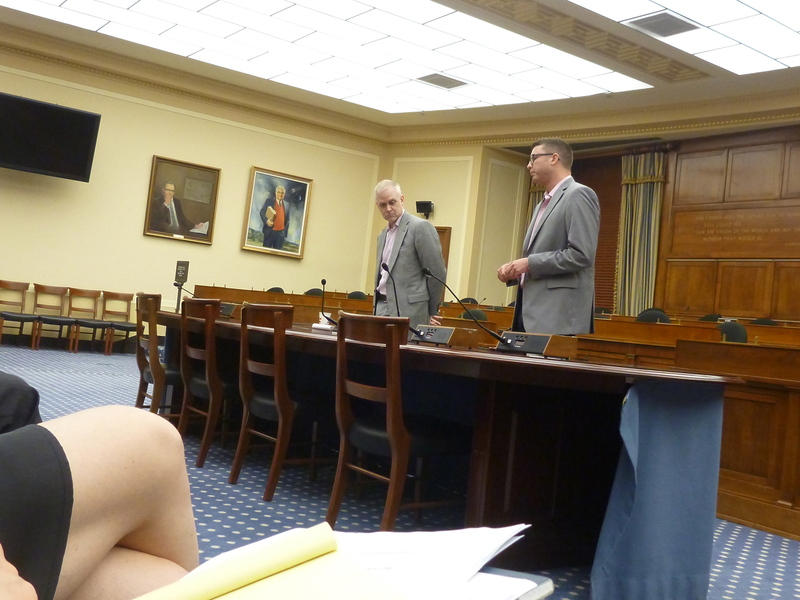 It also echoed the concept of knowing what your audience (e.g., constituents, fellow committee members) wants. Judy Schneider, Specialist on Congress at the Congressional Research Service and one of our esteemed speakers, discussed the important “P’s” underpinning governance: policy, politics, procedure, and patience. I would say our legislation group exercise experience emphasized the truth in her statement. Greetings from Washington DC! Gifford, Alexandra and I are in the capitol for a 10 day crash course on science policy that is hosted by the American Meteorological Society. 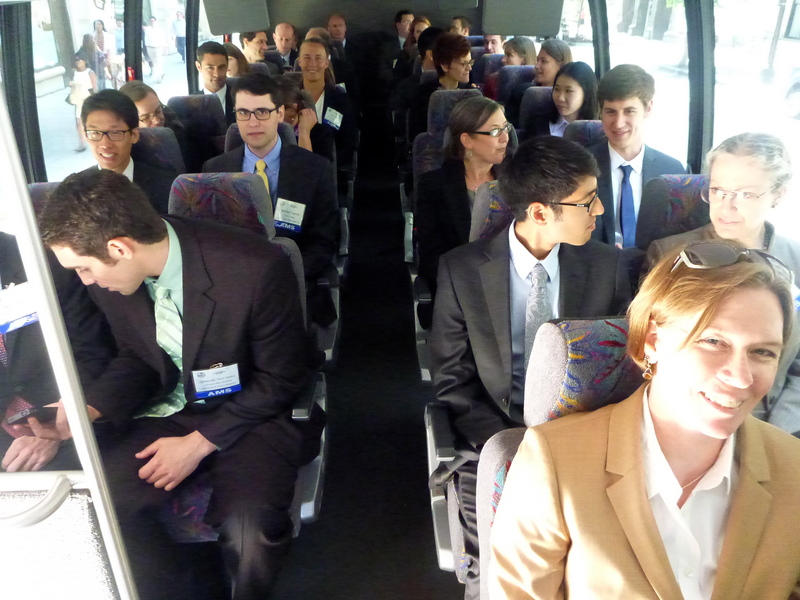 We have joined 33 other participant to learn the fundamentals of science policy, meet with experts, and learn through hands-on exercises. The participants make for a dynamic group. 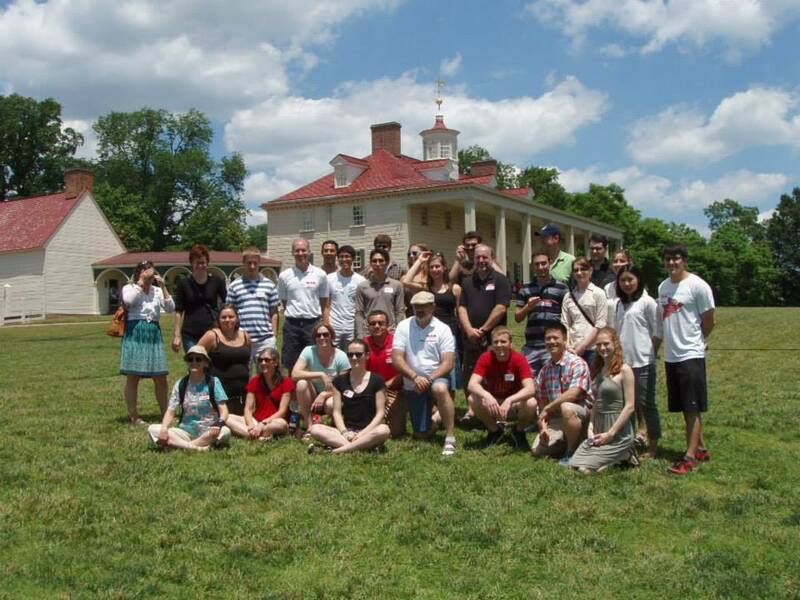 We have a very wide variety of backgrounds, including: grad students, post-docs, climate modeling research scientists, social scientists studying climate and extreme weather, a science education expert, professional forecasters, and NOAA administrators. The diversity of experiences and perspectives make for lively discussions during our meetings and interesting conversations during breaks and over meals. What is science policy anyway? In short, it captures two key concepts: (1) “science for policy,” meaning science that is used to assist or improve policy decisions, and (2) “policy for science,” meaning policy that determines how to fund or structure the systematic pursuit of knowledge (science!). For instance, science for policy includes carbon models that are used to project future greenhouse gas emissions and the risk that our activities pose for the future. On the other hand, policy for science determines how much money is given to science and technology and how it is prioritized among areas of research. 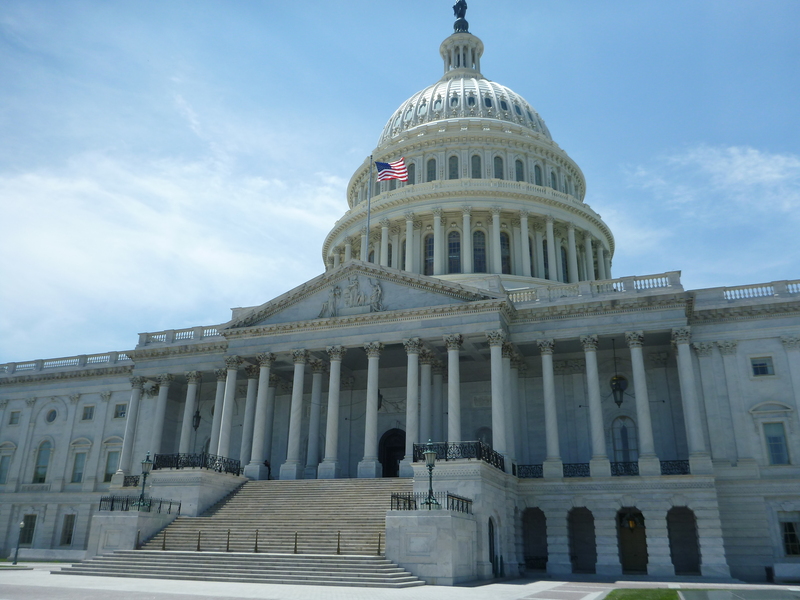 After morning presentations and discussions, we spent the first two afternoons of the Colloquium visiting Capitol Hill for meetings with staffers and experts in the Senate and House of Representatives. 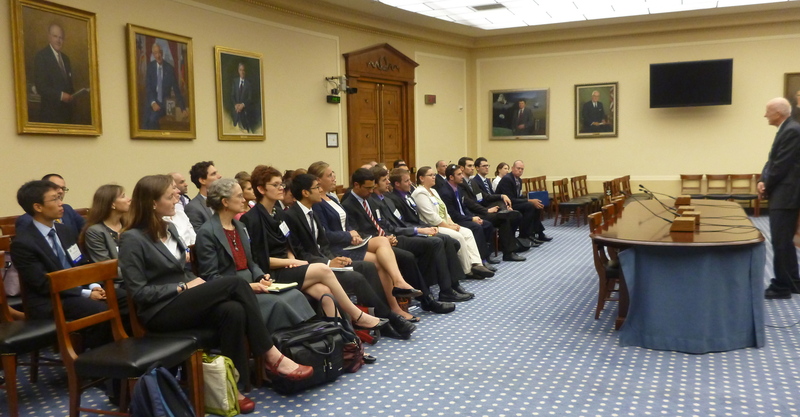 It is exciting to be around people who are learning and talking about science policy. More than anything, these first days of science policy “boot camp” have taught me that there is so much more to learn about how policy and politics(!) are connected to science. Hanover, New Hampshire has a population of 11,000. It is 90 miles from Burlington, 120 from Boston, and 260 from New York. Undergraduate and graduate students at Dartmouth College have tremendous global learning opportunities, and, as an IGERT student, I have received enormous support for developing my less-conventional career goals in the policy arena. Still, Hanover is geographically distant from scientific and political hubs, and I do not regularly interact with the larger community of students and experts committed to ensuring a peaceful and sustainable future for the rapidly changing Arctic environment. The Arctic is warming faster than anywhere on the planet, three times the global mean temperature change, in fact. Its changes are affecting human populations, ecosystems, and economic opportunities, and the Arctic Council provides the sole forum for solution development and consensus building. The Arctic is unique in being a region where climate changes are affecting resource availability, human health, cultural heritage, and governance across many national boundaries—and to the great interest of the rest of the globe. As US Public Affairs Officer Steven Labensky stated on the first day of the winter school, “the ramifications and solutions to challenges [faced by Arctic nations] fall also below the 66th parallel.” He saluted the decision to include observer nations in the Model Arctic Council. I view the challenges faced and solutions developed by the Arctic states a mild harbinger of what is in store for the more politically volatile, more densely populated region of the Tibetan Plateau, where I also conduct research and ultimately hope to do diplomatic work. The Arctic Council – its procedures, its shortcomings, and its enormous successes – will serve to provide the world with a model for peaceful international dialogue and resolutions for collaborative adaptation and sustainable development. 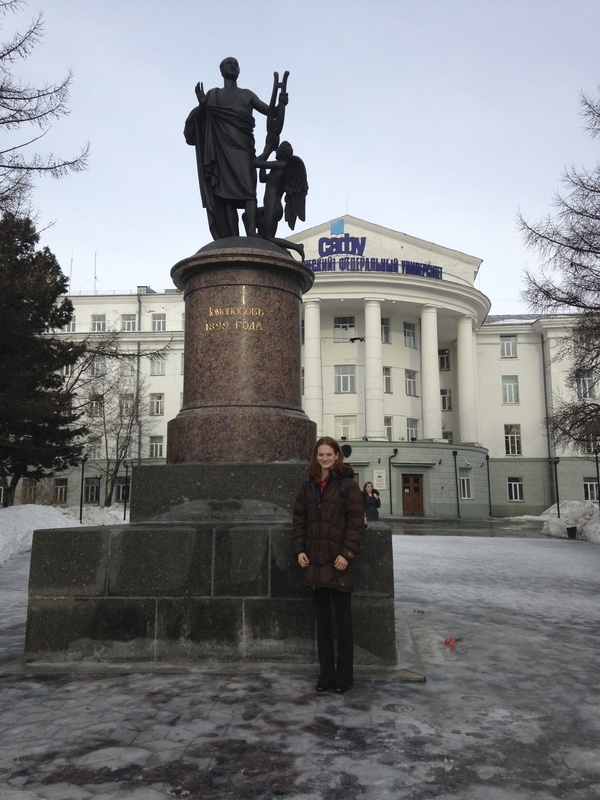 In addition to learning about the history, procedures, and priorities of the Arctic Council, I left Arkhangelsk reflecting on two subjects I had not necessarily anticipated: first, the role of scientists in Arctic diplomacy and, second, what it means for America—and for an American—to be part of the larger Arctic community. The Arctic Council formed in 1996, with the signing of the Ottawa Declaration, but its precursor began in 1991 with the Arctic Environmental Protection Strategy (AEPS). Although the AC now promotes coordination on issues ranging from health to economics to cultural preservation, it was exclusively environmental at its inception. Therefore, the work of earth and environmental scientists has always been of central interest and relevance to Council officials and ministers, and the AC’s working groups represent a closer formal and procedural tie between government leaders and scientists than I’ve been exposed to elsewhere. The Arctic Council’s working groups provide a pathway for soliciting and implementing science; however, much of the responsibility still lies with the scientists. A group that is balancing many interests, considerations, and priorities may not be able to seek out every aspect of relevant scientific work, particularly if it is not easily and readily accessible. What I’ve heard my adviser call “loading dock science” is a luxury that climate and Arctic scientists can no longer afford. We cannot conduct our work in a vacuum, publish it, and expect someone else to communicate it and advocate for its consideration in policy decisions. Nor can we continue to speak an arcane language only our scientific colleagues understand. It is not uncommon for an Arctic Council member to say to a scientist, “You’re speaking English but I don’t understand what you’re saying,” according to Prof. Douglas Nord who has attended several AC meetings over the last two decades. Scientists are not permitted to make official policy recommendations to the AC, but it is their responsibility to communicate results, their relevancy, and their implications clearly to ensure that decisions are made with consideration of accurate and up-to-date scientific knowledge. American universities are producing an astounding amount of research on the Arctic Ocean, ecosystems, ice, climate, and other aspects of the Northern region, which is particularly appropriate given the United States’ status as an Arctic Nation. I’ve had the privilege of traveling twice to Greenland and twice to Alaska for coursework and research, and so it surprised me that several of my friends seemed confused when I told them I was representing the U.S. at this Model Arctic Council. “Wait, what? Why does the U.S. care about the Arctic? [pause] Oh, just because of Alaska?” was a common response, even among my peers at Dartmouth. 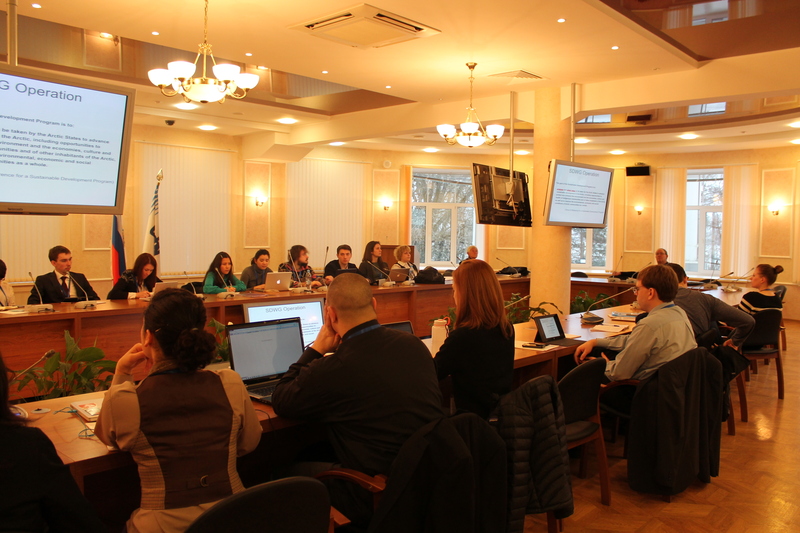 On the first day of the workshop, we participated in a roundtable discussion with policy representatives about the role of public diplomacy in Arctic issues. I posed the question of whether it’s problematic for the general American public not to understand the enormous opportunities and responsibilities associated with owning land and marine shelf in the Arctic. In terms of regional governance and international relations, perhaps the fact that many Americans view Alaska as a gas tank is not a problem. But choosing not to extend public diplomacy efforts to the younger generation seems, to me, a lost opportunity to engage the public in questions concerning the effects of, collective adaptation to, and equitable capitalization on changes in climate. Furthermore, by not actively engaging in Arctic issues, we miss exploring part of our identity as Americans. 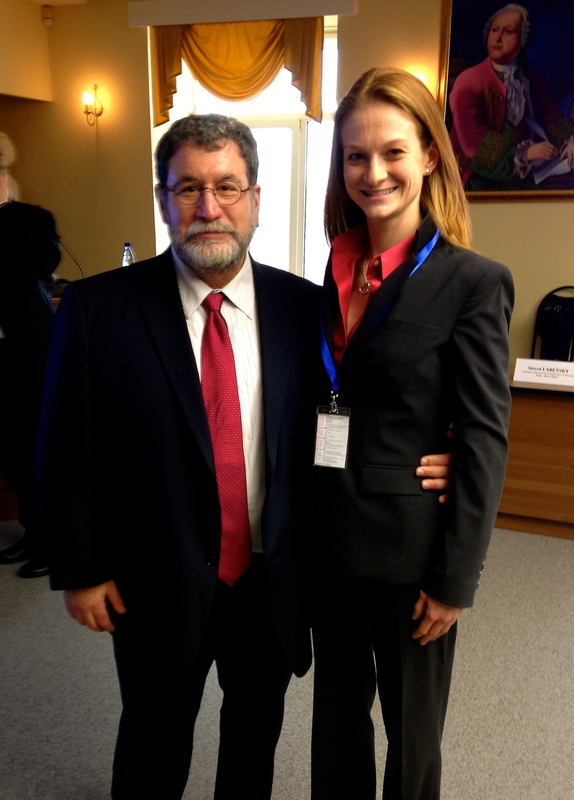 I was one of 5 participants representing the United States in Arkhangelsk and the only one not from Alaska. On the first day of the workshop, the group took an organized excursion to Russia’s largest open-air museum, Malye Korely. 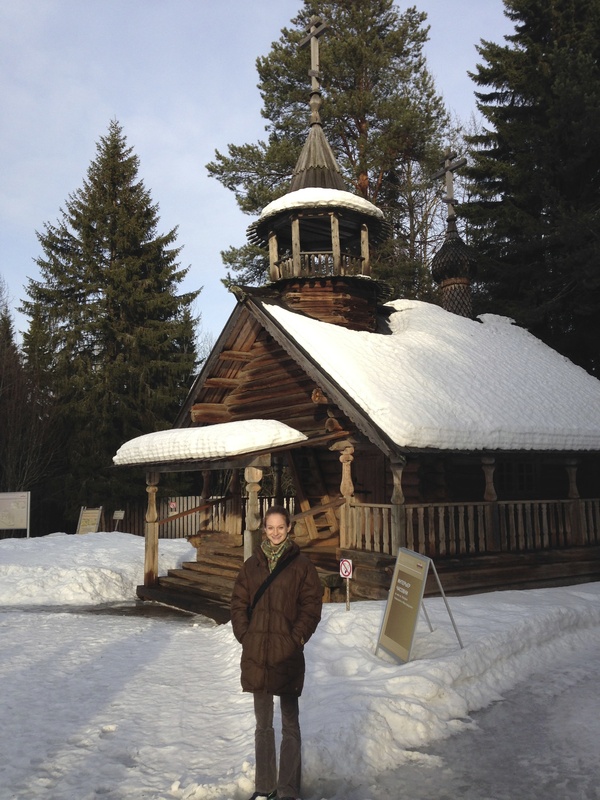 Standing outside a chapel at the open air museum, Malye Korely. As I walked among the 18th century churches and peasant homes, I realized that I knew embarrassingly little about Russian history. I tried to make up for what I’ve lacked in my history courses and my independent reading in the evenings (when I could get my internet connection to work). 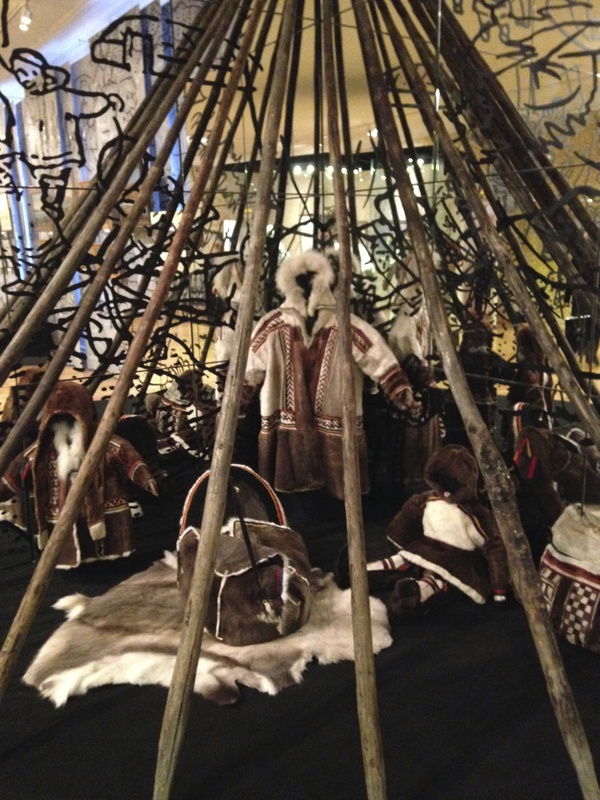 But it didn’t hit me until the conclusion of the Model Arctic Council, when we were invited to the grand opening of the exhibition on American Russia at Arkhangelsk’s Museum of the Arctic, that Russian history—at least prior to the purchase of Alaska in 1867—is part of American history. 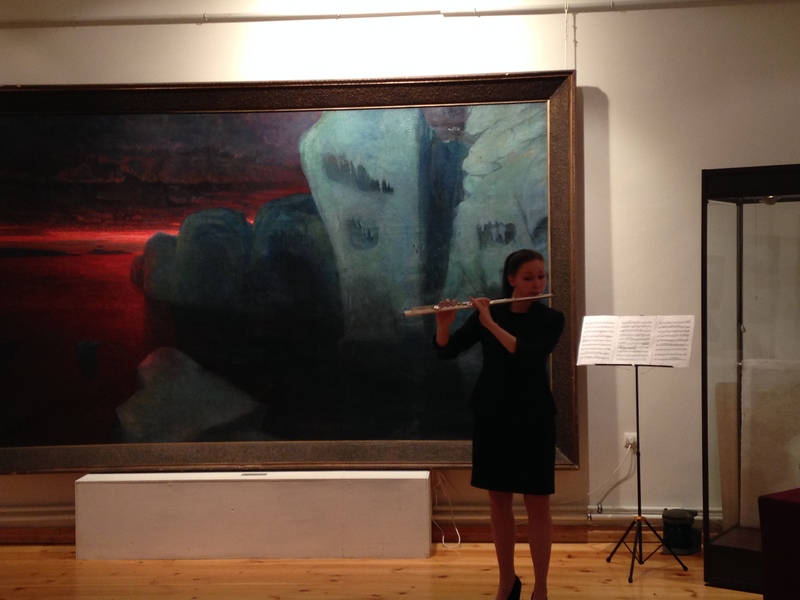 Museum of the Arctic: opening of exhibition on American Russia. A native New Englander, I have always vaguely identified with European history. But to the rest of the international Arctic community, particularly to the Russians, Americans are the people who acquired Alaska. It’s crucial to remember that this one state, with its unique geographical location and associated history, is an important part of our country that provides us with the privilege to contribute to developing, protecting, and preserving one of the most vulnerable parts of our planet. Given the increasing interest in the Arctic—from the international scientific, business, and health communities—it seems fitting, and perhaps even imperative, to expose the next generation of policymakers to the inner workings of Arctic diplomacy. During the last week of February, I had the privilege of representing the United States and Dartmouth College at the first ever Model Arctic Council, a role-playing conference with the same goals as the Model UN: expose students to high-level policy negotiations through experience and participation. 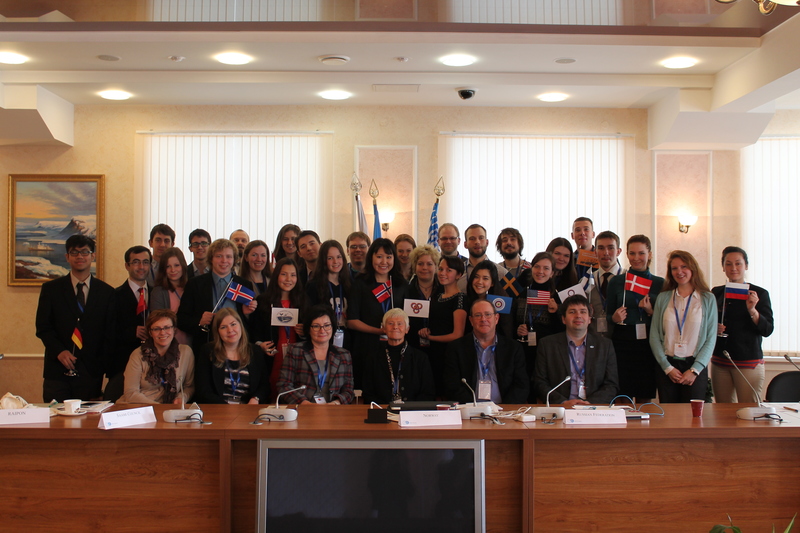 The Northern Arctic Federal University (NArFU) in Arkhangelsk, Russia hosted 30 graduate students from over 10 countries to simulate the proceedings of the Arctic Council, the high level intergovernmental forum through which Arctic governments and indigenous peoples discuss and take tangible actions to address the economic, social, health, safety, and security issues that they face. In front of Northern Arctic Federal University. The first of four days (see program) consisted of lectures and round-table diplomacy discussions led by prominent government figures: US Embassy Public Affairs Officer Steven Labensky, Russian International Affairs Council Deputy Program Director Timur Makhmutov, and Dr. Lev Levit of the Arctic Council Secretariat. Additionally, students engaged in lectures by Arctic experts in academia: Prof. Hitchins of University of Alaska spoke on the history of the Arctic Council, Prof. Nord of Western Washington University shared his tremendous insights on the changes in and challenges for the Council from his involvement over the past 22 years; and Prof. Alexander Sergunin of St. Petersburg State University lectured on international relations and security strategies. Me with Officer Labensky of the US Embassy. 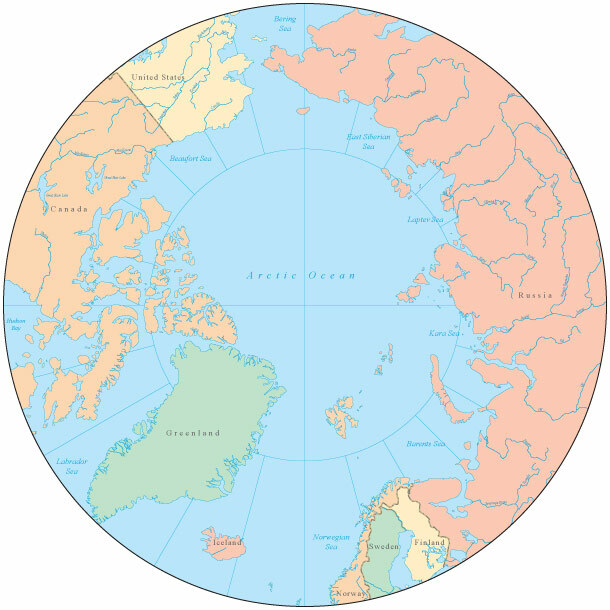 The following days involved simulations of the three types of meetings run by the Council: a biannual meeting for one of the six Working Groups, which implement research and projects related to specific interests; the biannual meeting of the Senior Arctic Officials; and the biennial meeting of Arctic Ministers (the Secretary of State represents the US in this meeting). Each was a progressively higher-level meeting to which participants passed along information discussed and resolved at the lower-level meeting the previous day. 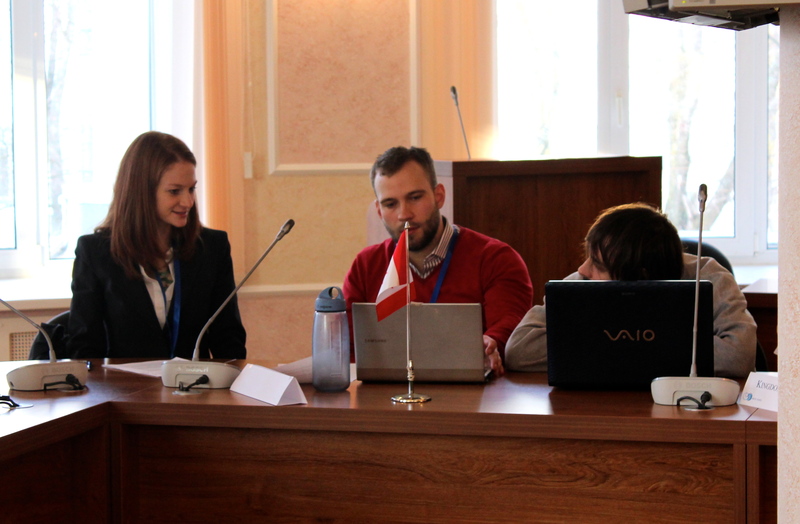 Students followed the Council’s Rules of Procedure while representing delegates from the 8 Arctic States, 6 Permanent Participants of indigenous groups, 4 of the 6 Working Groups, and 3 of the 12 non-Arctic observer states. Each role was assigned prior to the meeting, and students prepared written position papers as well as oral statements or presentations for the meetings. I played the chair of the Protection of the Marine Environment (PAME) working group during all three levels of negotiation. As the sole PAME representative, I contributed information related to achieving economic and social development while simultaneously ensuring sustainable marine resource use, maintaining biodiversity, and minimizing pollution. I represented the group that provides guidance to the Arctic Council on how to strengthen governance and environmental management, and I contributed environmental considerations to the conversation. The working groups provide the primary pathway through which scientists’ work informs the policy measures and initiatives developed through the Council and was, thus, of particular interest to me as an Earth Sciences PhD student. Developing language for the Declaration. Our task and final product was the “Arkhangelsk Declaration.” Emulating those produced every two years at the Arctic Council Ministerial Meetings, this document highlights progress and outlines future goals we agreed upon by consensus. 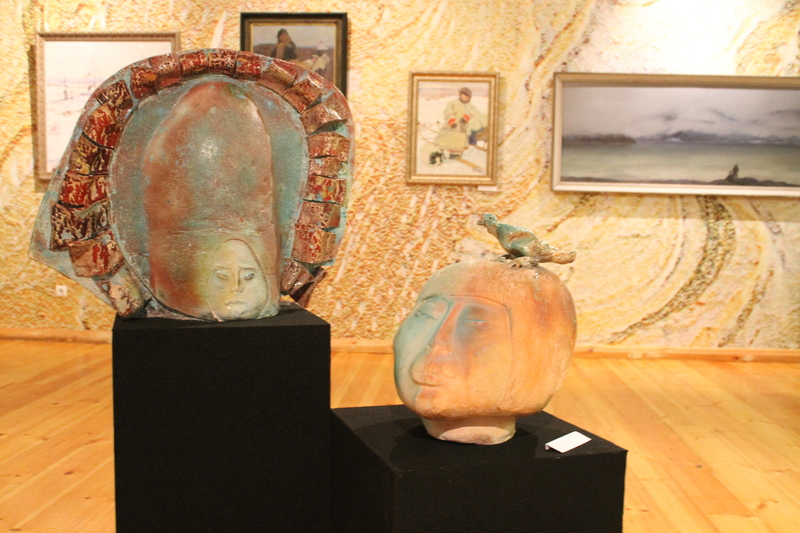 Specifically, the Declaration summarized our work creating and designing initiatives to revitalize indigenous language, facilitate international electronic sharing of historical archives and data, stimulate product development within the reindeer herding industry, and address the incidence of suicide in Northern communities. Overall, the discussions were engaging, the negotiations successful, and the resulting plan both compelling and achievable. 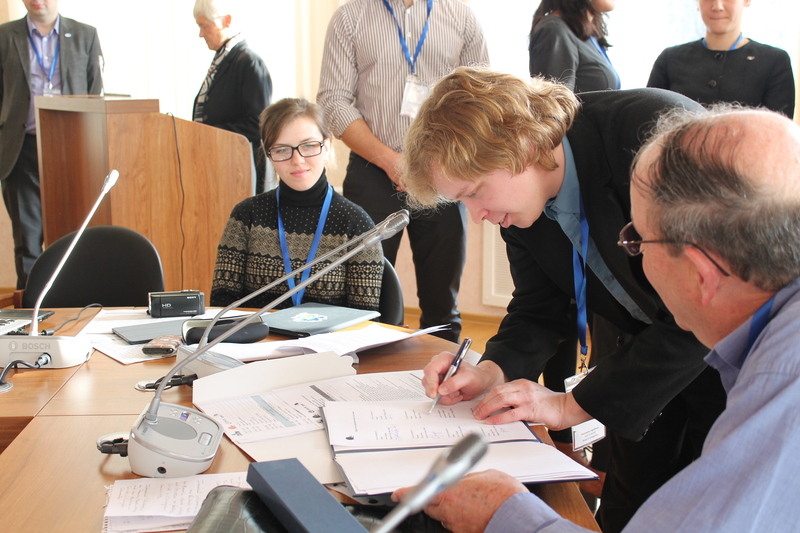 Daniil Erofeevsky of NArFU, representing of Ambassador Thorsteinn Ingolfsson from Iceland Ministry for Foreign Affairs, signing our Arkhangelsk Declaration.